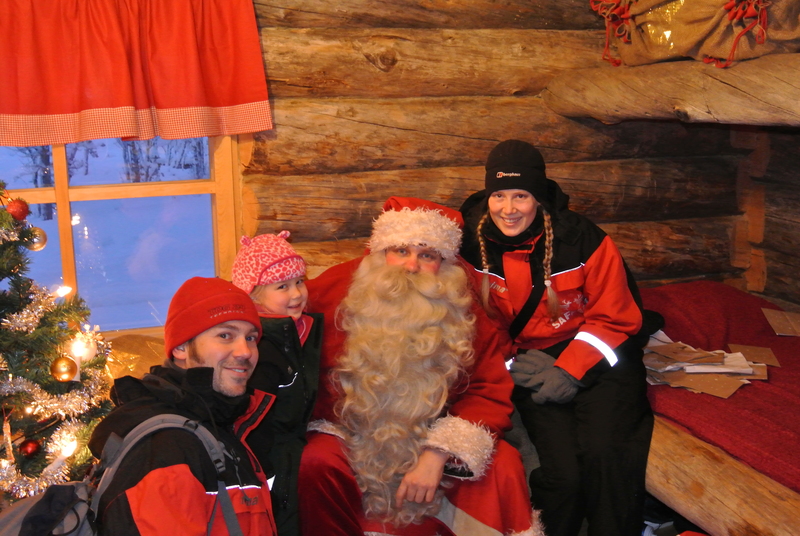 You are here: Home » Visit the Real Santa in Lapland! This year, my partner had to work away over the whole of Christmas. These magical Christmases with our daughter are not going to last forever, so rather than him miss out on the magic, he decided to book the three of us on a trip to Finnish Lapland to visit Santa before he left. 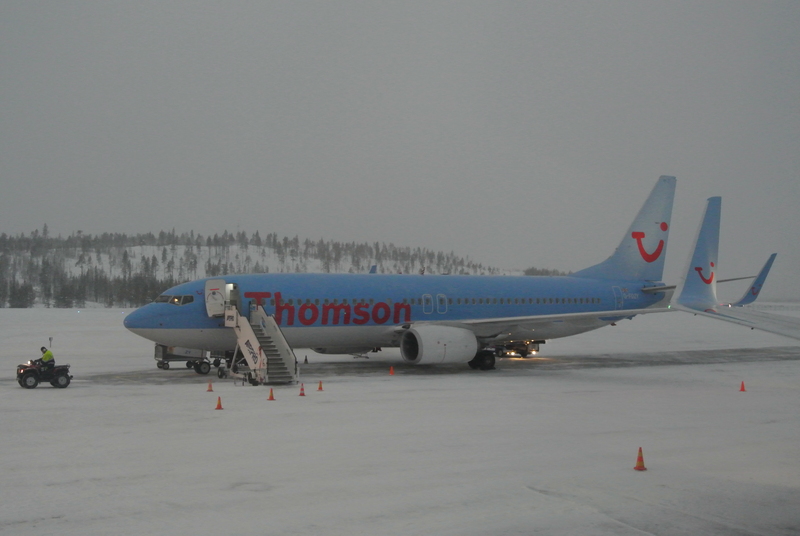 We flew out with Thomson to Saariselkä, which was the most Northerly area of Lapland that they fly to (in the hopes that we’d also get to see The Northern Lights). The flight out was magical. The cabin crew were great fun, singing Christmas carols with the passengers, wearing santa hats and getting the Children excited by doing colouring competitions. It was very odd landing at 2 in the afternoon in the twilight. In the arctic circle in winter, the sun never rises in the Winter, and never sets in the Summer! In mid-December, there are about 2-3 hours of dim light during the day (though technically-the sun hasn’t risen), and the rest of the ‘day’ time is in the pitch black. It was -22°C when we landed and I vividly remember the cold temperature biting the inside of my nose like tiny sharp needles of stinging pain! …Oddly though, I didn’t feel bitterly cold all over-despite not taking a coat with me! In case you think I sound like I’m barking mad for not taking a coat. Lapland Safaris provided all of our outer winter wear on a hire basis… All we had to take were thermal base layers, thick socks, scarves and hats. The gloves/mittens, boots and outerwear were all included in the cost of the holiday! We stayed at The Snowflake Hotel (locally known as Hotel Riekonlinna). It had the best reviews for families in this area, and for good reason-as it was the only hotel with kids reps and family entertainment. On our second day (first full day there) we were taken on our Santa trip. Arriving to Santa’s pine forest in the dark and walking up the candle lit path with the flickering light dancing in the snow was just magical! Anyone would know we were about to meet the REAL Santa. The children rode in a sleigh behind the Snowmobile leader. Resting Huskies calling and woofing to one another-they clearly love their life! My family in the husky sledge, about to go dog sledding. One of the Reindeer. I love this picture. It was explained to the Children, that The Blacksmith Elf occasionally helps Santa to send some presents by magic Elf Dust power. The special Magic Elf Dust is thrown into the fireplace to magically transport the presents to their intended destination. The children were allowed to witness the magic in action and help the Blacksmith Elf to send some presents. The Magic Elf Dust in action! and of course The Main Event, meeting the Big Man himself…. SANTA! We were collected in a sleigh towed by a snowmobile for an exciting ride through the snowy forest. We had to sing Christmas Carols all the way-so that the magic of the Christmas music led us to Santa! My Family and I, standing outside Santa’s little Cabin. Santa Claus told her that she could open a gift from him. It was a game from the wish list she had handed him! She was so thrilled, and awe struck by him. This really was the most amazing day of our entire trip. SO SO SOO worth the expense. It really is the most magical Christmas experience.